Caroline B. Glick is a senior columnist at Breitbart News and the senior contributing and chief columnist for The Jerusalem Post. She is also a senior columnist for Maariv. She is the author of The Israeli Solution: A One State Plan for Peace in the Middle East, (Crown 2014) and of Shackled Warrior: Israel and the Global Jihad (Gefen 2008). 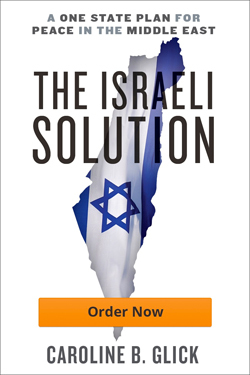 The Israeli Solution was endorsed by leading US policymakers including Vice President Mike Pence, Senator Ted Cruz and National Security Advisor John Bolton. Shackled Warrior was endorsed by Prime Minister Benjamin Netanyahu and former CIA director James Woolsey. Glick is the adjunct senior fellow for Middle Eastern Affairs at the Center for Security Policy in Washington, DC and directs the Israeli Security Project at the David Horowitz Freedom Center. She travels frequently throughout the world to brief policymakers on issues related to Israel’s strategic environment and other related topics. She lectures widely on strategic and political issues affecting global security, Israel and the Jewish people, US-Israel relations, Israel-Diaspora affairs and Israel’s changing strategic landscape. In 2008 Glick founded Latma, the Hebrew language satirical media criticism website. She served as editor in chief of the site until it ceased operations in 2015. Latma changed the face of Israel’s social media and revolutionized the Israeli entertainment industry by bringing an alternative voice to the popular culture. Latma launched “Hakol Shafit,” a primetime, half hour satirical newscast on Israel television Channel 1. Glick served as the editor in chief of the program. Glick was born in Houston, TX and grew up in Chicago, IL. She moved to Israel in 1991, two weeks after receiving her BA in Political Science from Columbia University. She joined the Israel Defense Forces that summer and served as an officer for five and a half years. From 1994-1996, as an IDF captain, Ms. Glick served in the Defense Ministry as a core member of Israel’s negotiating team with the Palestinians. In 1997 and 1998 Ms. Glick served as Assistant Foreign Policy Advisor to Prime Minister Binyamin Netanyahu. From 1998-2000 Ms. Glick studied at Harvard University’s Kennedy School of Government and received a Master’s in Public Policy in June 2000. In the summer of 2000 Ms. Glick returned to Israel and began writing at Makor Rishon newspaper, (Hebrew). She served as chief diplomatic commentator for Makor Rishon until January 2008. In March 2002, Ms. Glick joined The Jerusalem Post as the newspaper’s Deputy Managing Editor and senior columnist. Today, as Senior Contributing Editor, Ms. Glick is the paper’s most widely read columnist. She began writing a weekly Hebrew language column for Maariv in 2014. She began writing at Breitbart in January 2018. During Operation Iraqi Freedom in 2003, Ms. Glick covered the US-led invasion of Iraq as an embedded journalist with the US Army’s 3rd Infantry Division. Reporting for the Post, Maariv, Israel TV’s Channel 2 and the Chicago Sun Times, Ms. Glick was one of the only female journalists on the front lines with the US forces and the first Israeli journalist to report from liberated Baghdad. Ms. Glick’s writings have also been published in leading newspapers and journals including The Wall Street Journal, The New York Times, National Review, the Journal of International Security Affairs, and Commentary. Glick blogs at her website www.carolineglick.com and on her Facebook author page. Glick has received numerous awards for her commentary. Among others, she received the Ben Hecht award for Middle East reporting from the Zionist Organization of America, the Abramowitz Prize for Media Criticism by Israel Media Watch, the Guardian of Zion award by Bar Ilan University and the Courage of Zion Prize for Zionist pioneering by the Moskowitz Foundation. The mother of sons and owner of two dogs, Ms. Glick lives in Efrat, in Gush Etzion.